Tourism is one of the major economy raising sources and traveling for health is cherry on top. Not only helps in increasing country’s economy but also provide an opportunity for a very wide range of population to take the advantage of the medical facilities throughout the world. Medical field development and enhancement in medical technology have extended a hand to support the sector and the other in the country’s economy. The pattern in the medical sector is aided by both natural and those created by the State and the private sector. • Health Tourism: It is to travel to receive medical treatment in specialized institutions jointly with tourism programs. • Wellness Tourism: It is account for people with good health are traveling to other cities or country to maintain their physical and psychological health in the course of receiving certain services in specialized institutions. Many medical institutions provide high-quality medical services but still suffer from un-utilized excess capacity. These institutions can be exploited by the customers across the countries or mother cities of the same nation. If the new market is made available to the customers at the cheaper rates than any other service provider the probability of crowd deviation will increase. Flexibility in marketing health and wellness tourism programs can intensify or reduce marketing based on the capacity available in the facility services. The patient will focus on his treatments and the services provided to him and the rest will be taken care of by the agencies such as transportation, accommodation, medical visas etc. Clients with better financial potential and desire to spend on additional services: Health and wellness tourism programs that endeavor for the peace of mind can be attractive to many, willing to pay for the services they offer. In this duet of tourism with health care, a medical facility will focus on its essential work, while the other party-the tour operator takes care of the other work balancing it perfectly. The health and wellness programs seek to provide tourism services to the tourists without making them wait, by arranging pre-defined date for the doctor’s appointment or any other processes that need to be taken care of to avoid delay in the treatments, in addition, they even have different travel packages for patients and their family members willing to travel. Healthcare tourism in India is a growing sector. In the year 2015 India's medical tourism sector was estimated to be worth US$3 billion. 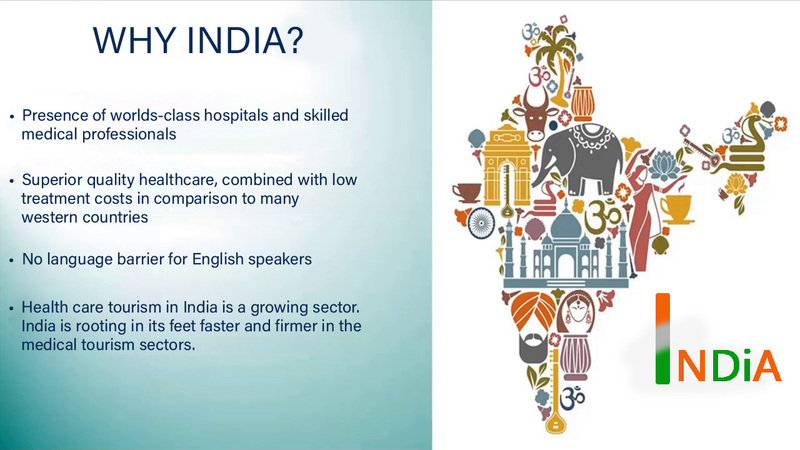 India is rooting in its feet faster and firmer in the medical tourism sectors. A major crowd from different parts of the world come to India every year for various surgeries and post-surgical treatments as well due to its cost-effectiveness and treatment from accredited facilities. Healthcare tourism agency India has become India’s largest sector both in terms of revenue and employment. • Clinic spots: Clinic spots is one of the popular ones in the field of medical tourism. It provides services in all the major metro cities of the country and has tie-ups with various famous hospitals in Mumbai. • Forerunners Healthcare: Forerunner is a medical tourism company in India and has services which are less time consuming and quick response. There are specialized in the simple booking process, low-cost surgeries, low risk of surgeries, lowest infection rates, systematic service etc are some of their main points of action. • Dr. Dheeraj bojwani consultants: this consultant works for its client’s needs and according to the client’s convenience. 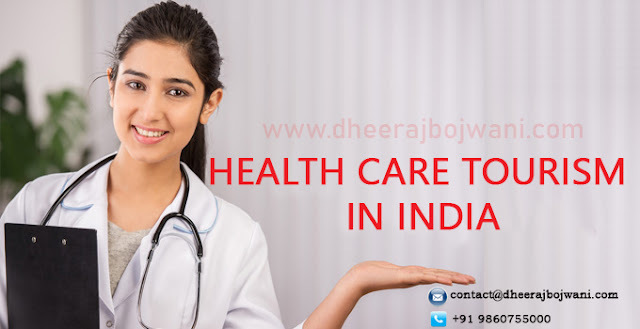 It is one of the renowned Healthcare Tourism Company in India, offering the best facilities to international patients with different healthcare packages and less cumbersome paperwork. Dheeraj Bojwani Consultants is said to be synonymous with the best amenities at the affordable budget. • MediConnect India: It is a medical tourism agency based in Delhi. They have an interactive portal and easy to connect options. • Global Treatment Services: It is Bangalore based company known for its Reliability and accountability.